Great Lakes Water to the West and South? No Way! Good friend Michael Dale, who toils for an unnamed Federal agency, sent me this article, which appeared in the Chicago Tribune on 28 October 2007. Governor Bill Richardson has backed off his "Wisconsin is awash in water" comment but the damage has been done. I am really surprised Richardson made the remark. He's a Westerner, and God knows that a Westerner should know that anytime he/she makes a comment that event hints of coveting someone else's water, even a neighbor's, them's fightin' words. Bill should take up pipe-smoking. The Associate Press published this five days ago. But I would not worry if I lived in New Mexico - Governor Bill Richardson will get lots of water from Wisconsin and the Great Lakes. Glad I moved to western Oregon. ALBUQUERQUE, N.M. (AP) — Researchers at New Mexico's two largest universities are painting a grim picture of New Mexico's economic and agricultural future with predictions that climate change will mean less water in the Rio Grande watershed. The study says New Mexico's social, economic and environmental systems are highly vulnerable to changes and disruptions to water supplies potentially caused by climate change. "Thus, the need is highlighted for water users, communities, organizations and institutions in New Mexico at every level and in every sector to begin considering possible adaptive strategies for making better use of their water resources," the study says. Global Warming and Ground Water-Fed Streams of the High Cascades: Supplying Water for the West? Colleague Patrick Griffiths, Water Resources Coordinator for the City of Bend (OR) sent me this article writen by Kate Ramsayer of the Bend Bulletin. Her piece describes the work of Dr. Gordon Grant, a colleague who works for the U.S. Forest Service and is a courtesy professor at Oregon State University. Grant has long been intrigued with the "peculiar river", the Deschutes River of central Oregon, which rises in the High Casacades and flows north to the Columbia Rver. The basin map is courtesy of the Deschutes River Conservancy (DRC). Unlike the rivers flowing west off the Cascades, the Deschutes and some others flowing east off the Cascades are fed predominantly by ground water, not surface runoff. Because of that, due primarily to the high permeability of the relatively young volcanic rocks comprising the High Cascades, the Deschutes is generally less prone to the vagaries of drought and climate change than its surface water-fed counterparts. Grant feels that fact may mean that the Deschutes' flow will better weather warmer climate. New Jersey: No Drinking Water By 2020? The article below is from the 24 October 2007 Asbury Park Press; Tom Baldwin is the reporter. Looks like the New Jersey water folks did not have 20-20 vision. Governor Bill Richardson (D-NM) had it wrong - the West will need to send water to the East. TRENTON — New Jersey officials heard sobering news Tuesday that the state is running out of drinking water, but environmentalists said the bigger problem is the government is not doing anything about it. "This is not a problem we have in the future. This is a problem we have today," said Joseph Maraziti, a former chairman of the State Planning Commission, addressing the state Clean Water Council's annual public hearing. "We have a gross underinvestment in infrastructure," Maraziti said, noting the crisis might strike by 2020, not long after today's first-graders graduate from high school. Fletcher Platt, executive vice president of the Millburn-based engineering consulting firm Hatch Mott MacDonald, said New Jersey's nearly 8.8 million residents will swell in numbers by a million by 2020. "We do have 100-year-old water-distribution systems," Platt said, noting water supplies are inadequate to meet projected needs. Platt foresees faster population growth in New Jersey than the Census Bureau, which projects the state will have nearly 9.5 million residents in 2020. It wouldn't reach 9.8 million residents until 2030, under those 2005 federal projections. Others at Tuesday's hearing also voiced concern about the water infrastructure. "We've been drunk with water," said Ben Spinelli, executive director of the State Planning Commission, saying the biggest problem is neglect. "We are probably going to be the first state in the nation to reach build-out . . . The infrastructure that is in the ground has started to reach the end of its useful age," Spinelli said. Sheila Frace from the federal Environmental Protection Agency said the politics of water, common in parched Western states, is moving east. "Where we have been is not going to get us to where we are going," Frace said, noting climate change is an added dimension to the demand-supply problem. Water, said Cranbury Mayor David Stout, has been the foundation of all civilizations. As if they were symbols of the problem, plastic-wrapped cases of bottled water rested on a table at one side of the room, though participants could have sated their thirsts at the drinking fountains out in the hall. Environmentalists such as Jeff Tittel of the Sierra Club, coupled with David Pringle of the New Jersey Environmental Federation, said they have heard these forecasts with annual regularity, but they see no action by Trenton. "It's the same message year in and year out," said Pringle. "Nothing changes. Are they going to get it this time? Our water supply is getting increasingly polluted, and the state doesn't have the policies in place to address that." "The state actually has policies that undermine clean water," said Tittel, such as spending $250 million in tax dollars to build a golf course on the Meadowlands instead of fixing Paterson's piping so rain-driven sewage does not spill into nearby streams. Tittel said monitors on rivers show that pollution has moved 10 miles west, upstream in east-flowing streams, such as the Metedeconk, and 10 miles east, upstream on west-flowing rivers that empty into the Delaware River. This article appeared in today's New York Times. A big issue in the Georgia-Atlanta water situation is the release of water from Lake Sidney Lanier down the Chattahoochee River to maintain environmental flows for endangered species. We have faced this issue in the West for a number of years. Last week, Georgia Governor Sonny Perdue filed an injunction against the Corps of Engineers to stop the release of water from Lake Lanier. Alabama claims it needs the water, and Florida needs it to maintain the fishery in Apalachicola Bay. For years, Florida, Georgia, and Alabama have tried to negotiate a compact governing the ACF (Apalachicola-Chattahoochee-Flint) river basin to no avail. The existence of such a compact might have improved the situation somewhat, but it certainly would not have mitigated the drought itself. Certainly, the lack of drought planning is a major issue here. No one saw this coming, or if they did, they chose not to do anything about it. What's that about the disconnect between land use planning and water planning? Visit the Watercrunch blog to see the latest information on this issue. 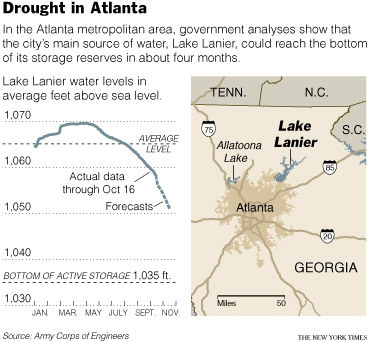 ATLANTA, Oct. 22 — For more than five months, the lake that provides drinking water to almost five million people here has been draining away in a withering drought. Sandy beaches have expanded into flats of orange mud. Tree stumps not seen in half a century have resurfaced. Scientists have warned of impending disaster. Gov. Sonny Perdue of Georgia declared October “Take a Shorter Shower Month.” And Saturday, Mr. Perdue declared a state of emergency for more than half the state and asked for federal assistance, though the state has not yet restricted indoor water use or cut back on major commercial and industrial users, a step that could cause a significant loss of jobs. These last-minute measures belie a history of inaction in Georgia and across the South when it comes to managing and conserving water, even in the face of rapid growth. Between 1990 and 2000, water use in Georgia increased 30 percent. But the state has not yet come up with an estimate of how much water is available during periods of normal rainfall, much less a plan to handle the worst-case event — dry faucets. “We have made it clear to the planners and executive management of this state for years that we may very well be on the verge of a systemwide emergency,” said Mark Crisp, a water expert in the Atlanta office of the engineering firm C. H. Guernsey. But a sense of urgency has been slow to take hold. Last year, a bill died in the Georgia Legislature that would have required that low-flow water devices be installed in older houses before they are resold. Most golf courses are classified as “agricultural.” Water permits are still approved first come first served. And Georgia is not at the back of the pack. 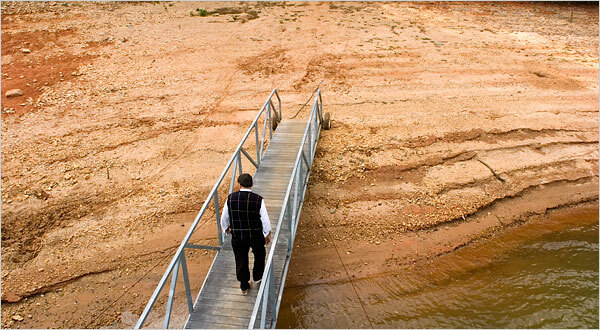 Alabama, where severe drought is even more widespread, is even further behind in its planning. A realistic statewide plan, experts say, would tell developers that they could not build if no water was available, and might have restricted some of the enormous growth in the Atlanta area over the last decade. Already, officials have little notion how to provide for a projected doubling of demand over the next 30 years. The ideas that have been floated, including piping in water from Tennessee or desalinating ocean water, would require hundreds of billions of dollars and painful decision making the state has been reluctant to undertake. “It’s been develop first and ask questions later,” said Gil Rogers, a lawyer with the Southern Environmental Law Center. “We are not here because we consumed our way into this drought, as some would suggest,” said Carol Couch, Mr. Perdue’s director of environmental protection. Bruce A. Karas, vice president of sustainability for Coca-Cola, said no one from the City of Atlanta or its water planning district had approached company officials to ask them to conserve water. Mr. Karas said the company had worked to reduce consumption on its own since 2004. Mary Kay Woodworth, executive director of the Metro Atlanta Landscape and Turf Association, said almost 14,000 workers in landscaping and other businesses that depend on planting and watering had lost their jobs. In 2001, the state did establish the Metropolitan North Georgia Water Planning District for 16 counties and dozens of jurisdictions in the Atlanta area. The district has focused on conservation pricing, under which the price of water rises with consumption, and on incentives for replacing inefficient plumbing and monitoring for leaks, a major cause of water loss. Some environmentalists criticize the district, saying its requirements are weak and its progress unmeasured. The district’s projections, they say, are based on an outdated estimate of water availability, provided by the state, that does not take into account climate change. Pat Stevens, chief environmental planner for the Atlanta Regional Committee, which provides employees to the water district, said the plan was being revised and the requirements would tighten. In January, the Legislature will consider a proposal to expand the planning process statewide. State officials defend their response, saying the drought got very bad very quickly. And Georgia is not the only state in trouble. The drought has afflicted most of the Southeast, a region that is accustomed to abundant water and that tends to view mandatory restrictions as government meddling. Lake Lanier is part of the Apalachicola-Chattahoochee-Flint River system, which forms much of the border between Georgia and Alabama and then spills into Florida. There, the river provides a habitat for two types of mussel and a sturgeon that are endangered. The temptation to blame the corps is strong. Because of years of litigation, the corps operates the dams on the river system under an interim policy driven largely by the need to protect the endangered species of fish and shellfish downstream. Critics say the policy’s minimum-flow requirement does not take into account severe dry spells and is not supported by science. Mr. Perdue has said that the flow is twice what nature would provide under similar circumstances. In response to Mr. Perdue’s complaints, the corps has agreed to consult the federal Fish and Wildlife Service, which protects endangered species, about modifying flow requirements in the Apalachicola River. With a public anxious over the possibility of running out of water, the corps has not been the only entity to shoulder blame. On Oct. 1, Stone Mountain Park began to make snow for a winter mountain, hoping to attract children who had not seen the real thing. The mountain was planned during the very wet summer of 2005, and the state and local governments were duly informed, said Christine Parker, a spokeswoman for the park. The state announced a Level 4 drought response on a Friday and, after park officials reviewed the list of exceptions for businesses, snow-blowing began the following Monday, before much of the public had fully grasped the severity of the situation. After the project was ridiculed in The Atlanta Journal-Constitution, the park shut it down. Ms. Parker said that only then did the park hear from state environmental authorities. Stone Mountain had never intended to take a cavalier attitude toward the drought, Ms. Parker said, but had not been given any guidance. If you want to keep up with the Altanta water situation and the Southeast drought, read Robert Osborne's excellent Watercrunch blog.